Hello and thank you for participating in the Object Desktop DeskScapes 10 Beta 2. Again, thank you for your feedback and participation. I'm using an Admin login and a Standard login. What is happening is similar but slightly different between them. "Always" happens. 2. 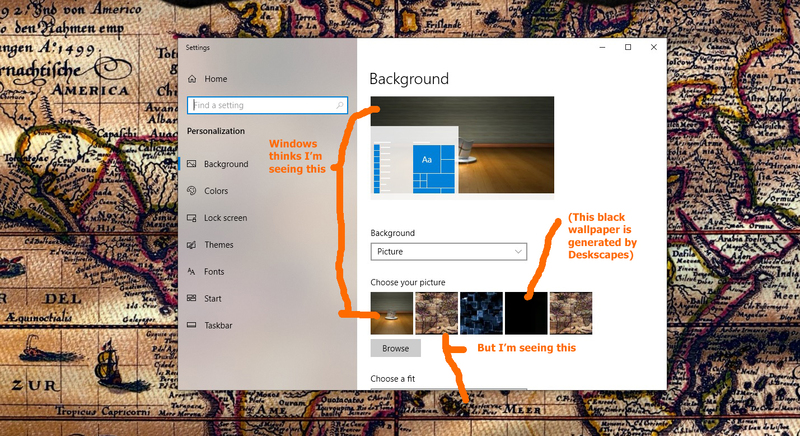 Select a new wallpaper using either standard Windows method of desktop right-click "Personalize" or File Explorer/image right-click "Set as desktop background". 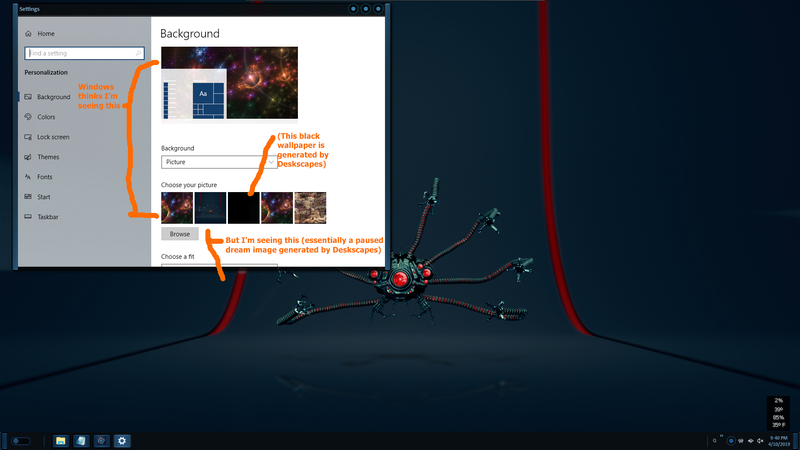 On the Admin login, I see a wallpaper only briefly after login until the screen refreshes (e.g. right-click on the desktop), then it switches to solid black. 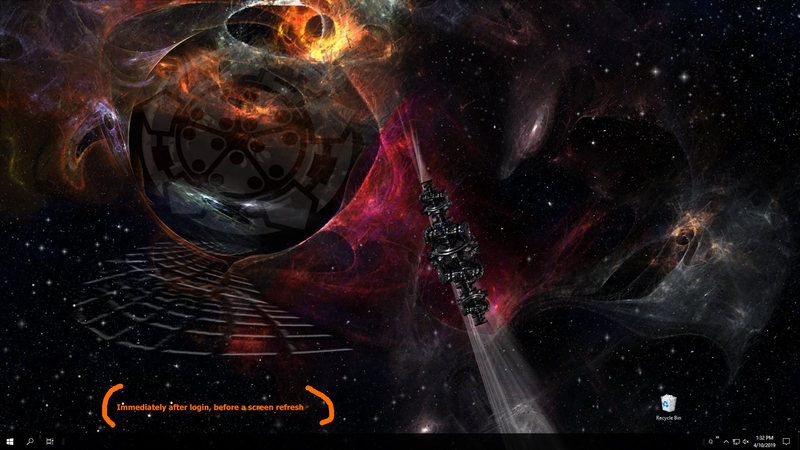 Note though that in the 2nd image below a wallpaper remnant is still visible under the taskbar. 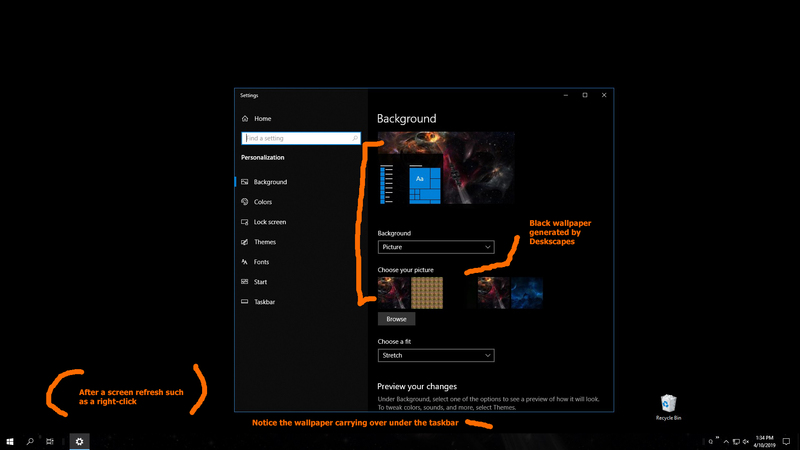 That remnant is "fixed" - making the taskbar double or triple height does not change the height of the wallpaper remnant. 3. Open Deskscapes, apply a dream (Sentinel here), exit Deskscapes. This is what I see on the Standard user until logoff, a wallpaper that looks like the dream paused. The proper wallpaper will display after another logoff/login. On the Admin user I see a black background very much like the 2nd Admin image above. I should add that after leaving Deskscapes disabled, turning off the machine, and turning it back on, the standard Windows wallpaper selection methods continue to (not) work as I described above. In other words, merely having the beta installed essentially cripples changing the wallpapers through Windows. 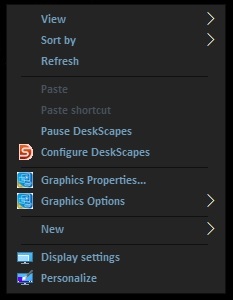 Applying a wallpaper via any other method would disable DeskScapes. It's probably just a matter of the way I tend to use DeskScapes, which could be a little unusual. I often run a dream or two for a little while and then just want to pop back to the wallpaper I had been using without having to fish it back out. No biggie though. Just as an FYI - the flickering Fences also is occurring on my Windows 10 desktop with the Beta 2 version as I reported on the earlier thread about Beta 1. It makes Fences useless to me on my machine. I tried following the help suggestions through the original thread, but they got lost with so many replies. As soon as I uninstall the Beta versions and reinstall version 8, my machine is fine. Unless this changes - there is no way I will use the new version. Windows version is Build 1809 (OS Build 17763.437). Video = AMD Radeon R9 270. This always happens. Impossible to get screenshot as it is random with mouse movement over the fences. No clue how to make a video. Impossible to get screenshot as it is random with mouse movement over the fences. No clue how to make a video. an image or video in this forum https://imgur.com/? Win 10 Beta was applied. Sure hope you can help as I have been a Stardock, Object user for several years, and sure would hate to be without it. It's unclear to me what your actual issue is . What Win 10 Beta , you mean Deskscapes 10 beta 2 ? How about a screen capture video showing your issue . Please explain in clear detail. Did an uninstall,Purge, reboot. Installed DS beta 2, reboot. I find the only thing I have to do is disable DS to apply another Dream. Otherwise everything else works for me now. you shouldn't have to disable anything to apply another Dream .. I don't and No others have reported having to do so . is that your only issue is with fences ? As far as I can tell - that is the only issue. The fact that it is rendered useless makes it hard to tell if there might be other issues. I had already tried this with Beta 1 - it did not change a thing. Have you tried a clean boot? Yes, I am talking about the Desk Scapes. (Beta 10). After I purchased the update to my Object Desktop, there was no way I could click on the Object Desktop Manager, to change my Desk Scape pictures. That feature has been missing on the "Installed" portion of the "Launch" line-up, of my Object Desktop Manager. but my Object Desktop Manager is supposed to include the Desk Scapes within the program, its self. Sorry my explanation is vague, but my knowledge of Tech. issues is also very vague. Hello. New around here and liking the products! Here now to provide feedback since it is a beta. 8.5 was working well with fences. I tried the beta1 and it was messy. Fences were no longer seen unless you clicked the mouse and scrolled. THEN, I could see like under a mist that disappeares as I passed by where Fences usually were in earlier version. Like an insight yet once passed, it would go back to desktop image/DeskScapes video. After an hour of playing around, I wiped Object desktop and started over. This time no Fences 3.0.9. DS Beta 1 actually worked correctly. I like Fences so I tried many combinations of how to install (Fences 1st or DeskScapes 1st etc). NO LUCK. I went back to 8.5 running and Fences which works fine on this system. Figured you would work this out although nobody was complaining of any issues online here until this new beta. Well now, I downloaded beta 2. OMG Brutal. Hangs video. Uninstalled Fences and same problem. No longer able to use DSK 10. I cannot close any boxes on screen. Continues worse to taskbar hangs. Like memory issue. Totally locks after pushing a few boxes. This is Beta 2 with no other Stardock products installed. Hopefully this will help. It is clearly a video issue IMO and I also have one other user login in W10 on this ROG Asus Lappie GL552VW. Dual video Intel and NV GTX960M for GPU. Here is a dump of what my system looks like. Mind you, I run DoNotSpy anti harvesting for W10 and DeepFreeze but usually leave it in "thawed" mode unless I am suspicious of downloads etc. If you are depending on apps contacting MS, that might be an issue. Let me know if you any other details. I really like DESKSCAPES10 and Fences. Just hoping we can get it resolved on my system. Finally ^^^ - I am not the only one with a negative reaction with Fences installed! There are some changes pending - keep an eye on the forums. If you need a Camstudio observation, let me know. I spent much time today making sure of my statements above. They are fairly accurate. Did a DSflush. I have plenty of Codecs loaded. K-light and pro versions. Probs feel very video driver driven. I updated the Geforce 960M today again but the Intel HD530 drivers are still showing from 2016. One small interesting hint. When I changed the bios in the Asus Laptop for video RAM dedicated from 512M to 256M, things came up different when I logged in.It didn't resolve the issues yet the background was what I had last asked for (a still) and for a moment, Fences was there.Once I started poking around on the screen, it just locked up more and more with each window I tried to access. Took like 4 or so before hanging. interewsting is that if I go to Object desktop, no matter what i do, it never hangs, nor does Fences tabs etc. FYI. I know the things are not easy to diagnose. I just putting out what I spent a few hours on to be of assistance. In the end, I loaded 8.5 from scratch and Fences. Worked fine. Two other points. I am not a gamer and have zero games loaded on this system, since my environment is probably very different than a developer. Perhaps there is a dependence on a driver most gamers would have? I also updated the KB4493509 2019-04 x64 for the W10. FYI. I know the things are not easy to diagnose. I just putting out what I spent a few hours on to be of assistance. And thank you for it - will look forward to your continued support and feedback when the update is released.